Welcome to La Empanada Gourmet! If you haven't ever tasted a true South American Empanada, you owe it to yourself to try our authentic, home-made pastries. 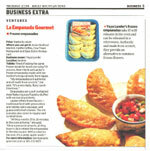 La Empanada Gourmet handcrafts delicious, ready-to-bake, frozen puff pastry empanadas in a variety of flavors. A true taste treat! They're perfect for parties, celebrations, a great accent to any menu! We are now offering two new South American products: Chimichurri Sauce and our just-introduced Arepas! We have bulk and retail packaging - perfect for caterers, markets and restaurants.